Based in the heart of Cambridge, we are a much loved independent café serving up authentic food, with that famously cheerful Mediterranean atmosphere. From a perfect, rustic sourdough pizza to fantastic focaccia, delicious arancini, a traditional selection of cakes and cannoli and an artisan gelato worth queuing for, everything is lovingly handmade by our chefs following our family recipes. See our skilled ‘pizzaioli’, Italian for ‘pizza-makers’, in action stretching the pizza and pulling it out of a traditional stone oven, in our shops window, to the amusement of the passing crowds, come along and enjoy the show! Sicilian Feasts, created for all your special occasions. If you are looking for tasty, freshly cooked delicacies to impress your family, guests or colleagues, look no further: AROMI CATERS! 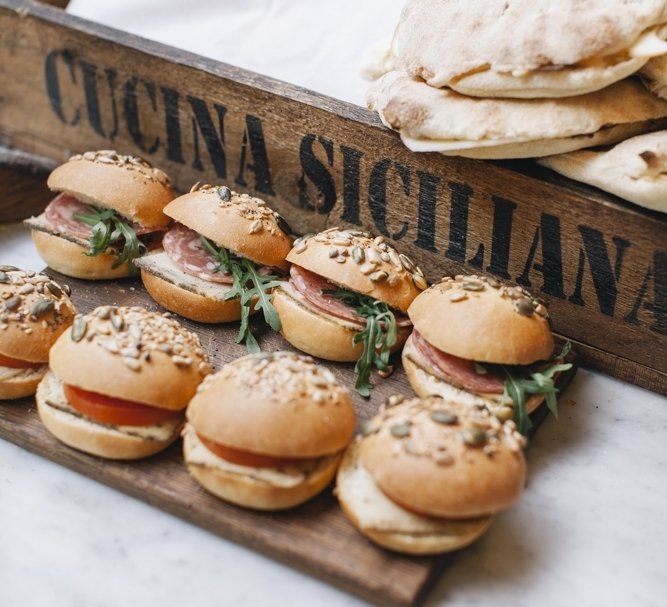 You can choose a selection of our bits and nibbles from our exciting catering menu, where sizes are party-friendly, meaning you can combine many dishes with different flavours and textures, which will take you on a tasting journey through Sicily. If your mouth is starting to water, it’s time to get in touch with us, we’ll be happy to help! We look forward to seeing you soon! Out terms and conditions can be found here. Wondering what’s the secret behind our crispy and light sourdough? Well, it is made of three simple ingredients: flour, water and mother of yeast. During a slow 48-hour fermentation, starch and gluten are naturally broken down, so the final result is a much lighter, easier to digest dough where you’ll only have to take one bite to enjoy its goodness without the guilt! Our flavourful toppings change seasonally and include the finest Italian air-cured meats and tasty Sicilian cheeses, all paired by our skilful chefs following our cherished family recipes. Following in the footsteps of Caffe’ Cipriani, our beloved family coffee shop, set in the charming piazza of Acireale since 1957, Aromi opened its doors in 2013. Since then, with its cheerful Mediterranean atmosphere, it’s been serving traditional Sicilian dishes, along with many cups of its special blend coffee, to Cambridge crowds, bringing a slice of Sicilian life to town. All our freshly made, authentic delicacies, are a testament to the Aromi ethos: handcrafted honest products prepared using traditional Sicilian techniques.